Mystery surrounds a 13-pound unidentified flying object which fell from the skies in northern Namibia. Despite efforts by researchers to identify its composition and origins, nobody has been able to establish where the metal sphere came from. 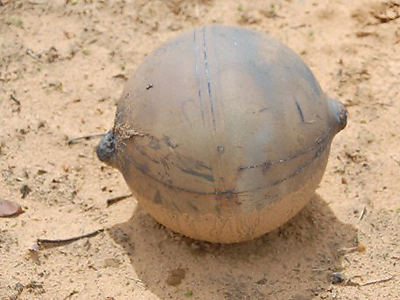 The ball, weighing 13 pounds (5.9 kilograms) and measuring 14 inches (35 centimeters) in diameter hit the ground next to the Namibian village of Omanatunga in the Omunsati region in the north of the country. Locals reported hearing a series of loud explosions before the sphere was found by a farmer sometime between November 15 and November 20. The metal ball was found some 60 feet (18.3 meters) away from a small crater it is assumed to have created when it fell. Ever since, local officials and researchers have been kept busy investigating the origins and make-up of the mysterious ball. Local police chief Vilho Hifindaka was quick to calm everyone down by saying the object did not pose any danger, as it was hollow inside. The director of the Namibian National Forensic Science Institute, Paul Vidik, said the two sides of the ball appear to be welded together and that the sphere contains a metal alloy used in spaceships. 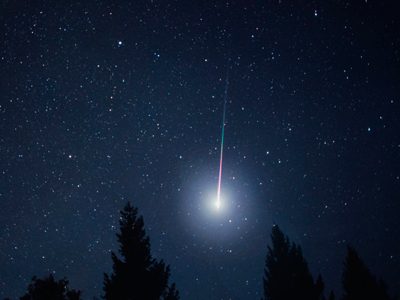 He rejected the idea that it could be an extraterrestrial object and said such findings are commonplace throughout the southern hemisphere – in South America, Africa and Australia. 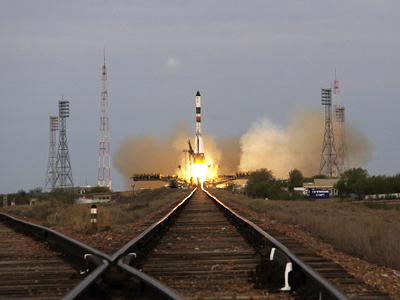 Russian specialist Igor Lisov, a columnist for the magazine Novosti Kosmonavtiki (Astronomy News), believes the sphere is part of the third stage of the Russian “Soyuz-U” rocket that carried the transport ship “Progress M-13M” on October 30. 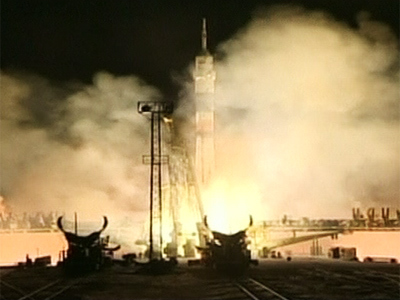 Lisov said the trajectory of the third stage’s fall indicated it was to hit the ground in Namibia on November 1. However he denied that the object could be part of the stranded Phobos-Grunt probe as it has not yet entered Earth’s atmosphere and is not expected to fall to Earth until late January 2012. The sphere incident isn’t the first space debris story to hit the news this year. In September, the Upper Atmosphere Research Satellite made headlines when it threatened to fall right onto Britain but eventually collapsed into a remote part of the Pacific Ocean. In October, the German Roentgen satellite split up into 30 chunks, one of which weighed 880 pounds (400 kilograms), but those globs eventually made their way down to the Indian Ocean.